Joined by resellers from around the world, ACCESS Manufacturing Systems was honored at the 2018 CAMWorks Global Partner Summit. ACCESS stands out in their commitment to supplying the manufacturing industry with strong products and services and ongoing support. 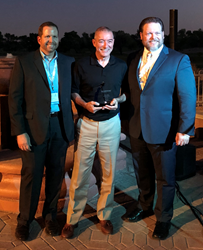 ACCESS Manufacturing Systems received the HCL Technologies CAMWorks 2018 Worldwide Top Sales Partner of the Year award at the LaunchPad 2018 Annual CAMWorks Global Partner Summit, held in Scottsdale, AZ, from June 4-7, 2018. ACCESS received the award among more than 60 CAMWorks value-added resellers (VARs) from Asia Pacific, Europe and the United States. The Worldwide Top Sales Partner of the Year award recognized ACCESS for their sales growth in FY2018, in addition to their product knowledge and best-in-class service and support standards. The 2018 Partner Summit event, themed ‘Launchpad,’ was organized as a platform to re-engage, refuel, and launch CAMWorks VARs to achieve their desired goals. During the event, ACCESS application engineers completed the most up-to-date CAMWorks certification programs and testing. The ACCESS team also participated in sales partner roundtable discussions, with a focus on industry trends and advanced CAM technologies. ACCESS Manufacturing Systems, Inc. is the largest CAMWorks® reseller in the world. For more than 30 years, ACCESS has delivered best-in-class manufacturing software and accessories, along with unsurpassed industry expertise, to thousands of companies across the nation. Our extensive industry knowledge has allowed our customers to enhance their machining operations by reducing setup time, doubling machine capacity, and improving overall quality. To gain ACCESS to the most qualified team of CAM experts in the industry, please visit http://www.accessmfgsys.com, and connect with us on LinkedIn and Facebook.